TH E M R EP O RT | 53 O R I G I NAT I O N S E R V I C I N G DATA G O V E R N M E N T S E C O N DA R Y M A R K E T THE LATEST ORIGINATION What's Worrying Mortgage Lenders in 2018? 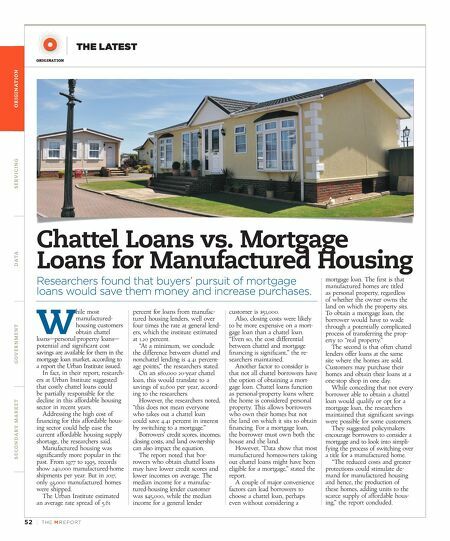 Lenders name their concerns but they also suggest possible solutions. I nflation, the triggering of higher interest rates, plus the re-emergence of alternative mortgage products are the most pressing challenges for mortgage lenders in 2018, according to a recent Genworth Mortgage Insurance Industry Survey. The survey, which asked industry profession- als their opinions on the biggest challenges the industry and market were facing in 2018, revealed that 79 percent of respondents cited these as the most notable challenges for the rest of the year. An additional 17 percent cited loosening of credit standards and 4 percent said excess liquidity in the mortgage market worried them. "Rising interest rates and inflation, when combined with today's inventory shortage, are ac - celerating home-price appreciation, causing some lenders and consumers to explore less-tested methods for financing home purchases," said Rohit Gupta, President and CEO of Genworth Mortgage Insurance. Genworth also asked respondents what they considered the best ways to improve access to credit in the mortgage market. Removing legal uncertainty for lending companies originating FHA loans topped the list of improvements, with 44 percent lenders saying it would ease credit access. Lower compliance costs for lenders (33 percent) and adoption of alterna - tive credit scores (14 percent) were some of the other methods they suggested to improve access to credit in the mortgage market, the survey found. Around 12 percent of lenders also said that more ambitious affordable hous - ing goals for the GSEs would also help. Speaking of GSEs, 68 percent of respondents said they had begun to integrate or had already fully integrated GSE Day One Certainty tools into their processes. However, 32 percent said they had still not begun using third-party data validations on DU/LP loans, the survey said. The Genworth survey also examined in - dustry sentiment on the role of compensating factors in underwriting, navigation advance- ments in loan-processing platforms, and GSE Day One Certainty tools. It revealed that 92 percent of industry professionals agreed that given the recent rise in Debt-to-Income (DTI) limits, compensating factors should play a role for above 45-DTI applicants. Technology was also a concern for many lenders, with 54 percent lenders saying they eas - ily identified with customizable dashboards for organization-wide production management as a top service they would like to integrate into their loan-origination system (LOS) platforms. 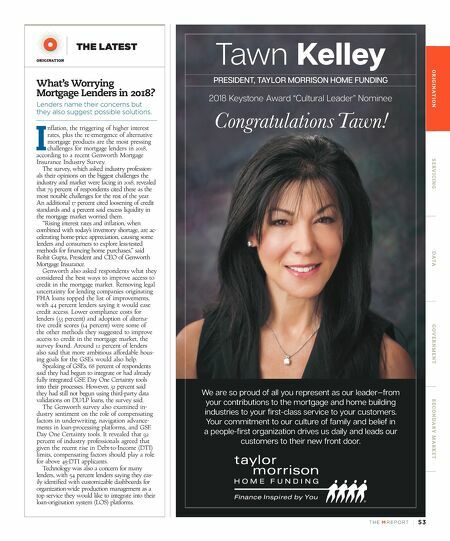 Tawn Kelley PRESIDENT, TAYLOR MORRISON HOME FUNDING 2018 Keystone Award "Cultural Leader" Nominee Congratulations Tawn! We are so proud of all you represent as our leader—from your contributions to the mortgage and home building industries to your first-class service to your customers. Your commitment to our culture of family and belief in a people-first organization drives us daily and leads our customers to their new front door.